The natural origins of the LaPerm have given rise to a healthy breed with no known problems. They are devoted mothers who tend to produce big strong litters which develop rapidly. Both coat lengths can occur in the same litter. The LaPerm gene is dominant, which means that some LaPerms (known as heterozygous) can carry the gene for straight hair. 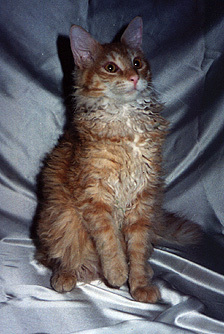 Sometimes straight haired kittens, or LaPerm variants, can appear in litters. These cats are like LaPerms in every way apart from their silky flat coats. They cannot be shown but are useful in breeding programs and make great pets. Breeders often use the initials BC, BB or BS in their kittens’ names; these stand for Born Curly, Born Bald and Born Straight. Those kittens like Curly who are born bald then develop a curly coat have become rarer as the breed has progressed. As with other rex breeds outcrossing has been an important part of breeding programs, ensuring that the breed maintains a large healthy gene pool. During the development of the breed the most popularly used outcross was the domestic cat or non-pedigree as these were closest to the original stock. Not any cat could be used and these had to be carefully chosen to conform to the desired standard. The LaPerm is a cat with no extremes but whose visual drama can pack a punch at first sight. They have a moderate foreign build with long legs and a long neck and the firm muscles you would imagine a cat bred from hardy working stock to possess. Their heads are a modified wedge shape with gentle rounded contours. They have almond shaped eyes, large cupped ears, long broad noses which have a slight break in profile but no stop and long broad muzzles with firm chins. The body is finished off with a medium long tapering tail. The coat is the breed’s most distinctive feature; it is unique and does not feel like the coat of any other breed. There are both longhaired and shorthaired LaPerms and both have curls all over their bodies. 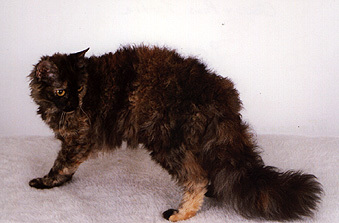 The shorthaired coat is wavy and stands away from the body with a tail like a bottle brush. The longhaired cat has a light bouncy coat which you can part by blowing on it. Ringlets can develop throughout the coat, especially on the neck, ruff and plumed tail. The ear furnishings are also curly and their ear muffs, or longer hair on the back of the ears, have been described as like angel’s wings. The coat feels very different to the other rex breeds; while stroking a Devon or Cornish rex can be like stroking a piece of rippled silk, the LaPerm has a “textured” coat which is more like stroking velvet. All colours and patterns are possible and some beautiful combinations have been produced. The light, single coat is low maintenance and is best kept in condition with a revolving toothed comb which can move through the fur without pulling the curls straight. The LaPerm temperament is very bold, inquisitive and friendly. They like lots of attention and cuddles and if you are foolish enough to ignore their demands to be picked up they may take matters into their own hands (or paws) and leap into your arms or ride around on your shoulder. They are very playful, energetic cats and some will bring their toys to their owners and ask for a play session, retaining their kittenish ways into adulthood. They are tactile cats and enjoy being stroked, making their pleasure known with their loud purrs. TEMPERAMENT: Bold, inquisitive and friendly. No extremes, yet packs a visual punch. COLORS: All colors and patterns.